What is the best way to take your photos? Does the background of the photo really matter? Can I take the pictures with my cell phone? Our latest revised, industry standard white paper release is all about your vehicle photos. If you’ve ever struggled and agonized over your vehicle photos, this guide is for you! 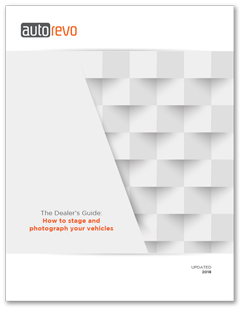 Whether you’re a veteran of photographing cars for dealerships or a newbie with a cell phone, this white paper is for you. We even give you the exact list of photos that you will need to perfectly showcase your vehicles and get them sold as fast as possible, from the basic drivers-side front angle photo to the content shots of the vehicle’s DVD and navigation systems. If you’ve ever used the AutoRevo InLine mobile app, it uses this list as the template to take photos right from your cell phone. Simply fill out the form, on this page, and then download your Automotive Photography guide!